SLASH—the iconic American rock guitarist, songwriter and film producer–has amassed album sales of over 100 million copies, garnered a GRAMMY Award and seven GRAMMY nominations and was inducted into the Rock and Roll Hall of Fame. Born Saul Hudson in England in 1965, SLASH’s father was a white British graphic artist and his mother was a black American costume designer. At age five, SLASH and his family moved to Los Angeles where he grew up in the nonstop bohemian playground of ’70s. SLASH helped create signature sounds like the guitar riff on #1 hits for Guns N’ Roses “Sweet Child o’ Mine” and “Welcome To The Jungle.” After leaving the band, SLASH went on to critical acclaim with SLASH’s Snakepit and global success with the supergroup Velvet Revolver before embarking on his own solo career. Time magazine recently named SLASH #2, behind Jimi Hendrix, on its “Ten Best Electric Guitar Players of All-Time” list. SLASH landed on the top of the charts again with his first solo album, Slash (2010) which featured Ozzy Osbourne, Fergie, Myles Kennedy and more. Shortly after, he then formed his current band: SLASH: Featuring Myles Kennedy and The Conspirators who have now been touring the world over and making music for four years. SLASH released Nothing Left To Fear (2013) the first-ever motion picture he co-produced from Slasher Films, his film/TV production company specializing in the horror genre. He is currently working on a new film project. SLASH and his band, Myles Kennedy and The Conspirators unleashed their current album WORLD ON FIRE to worldwide praise garnering SLASH some of the best critical acclaim of his career from the media. SLASH’s third straight solo album to debut in the Top Ten, WORLD ON FIRE achieved over 12 Top Ten chart debuts around the world. The album’s title track and first single “World On Fire” ascended to #1 at U.S. Rock Radio. 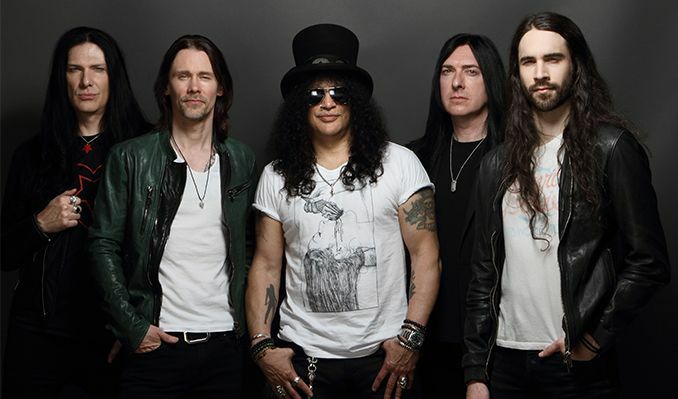 WORLD ON FIRE is SLASH’s third solo offering and second album with his official band The Conspirators which features MYLES KENNEDY (vocals), BRENT FITZ (drums) and TODD KERNS (bass).